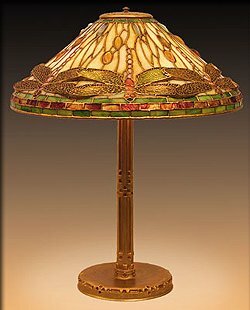 A nice gold “Dragonfly” with cone-shaped shade, 20 inches diameter, model #1495. It rests on a standard “Library” base, specifically called the “Fifteenth Century” pattern, model #528. Very nice colors in the glass. Shade and base both signed.